Looking to Live a Balanced Art Life? I was, and I found it. Back in 2011 when I started my studies as a visual practitioner, I had an idea to apply my newly acquired skills of drawing out conversations to the art coaching I was doing as a recent retired publisher of an arts magazine and exhibition director at an arts center. I was fascinated by the way making inquiries and writing down the responses in large-format had an impact on understanding, visioning, and outcomes for both the me and the artist. 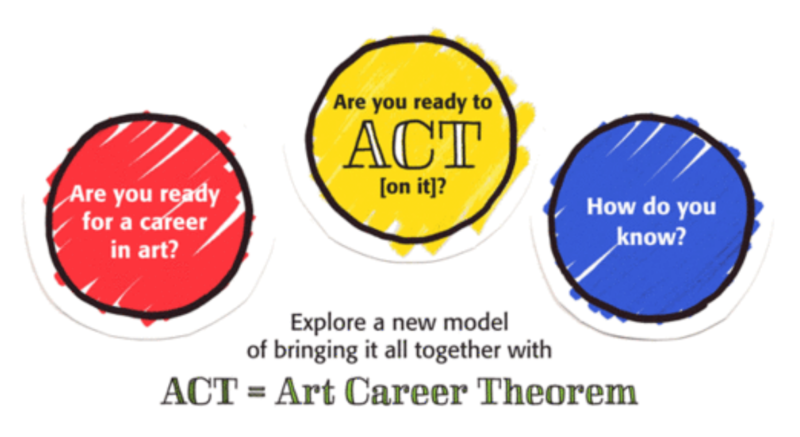 By 2014 I had developed an art career coaching model called Art Career Theorem (ACT) and luckily I had plenty of artists who were willing to be coached and were curious about the model. 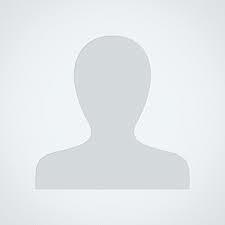 Pictured above: Snapshots from an ACT workshop. With a foundation of values-based decision making and visioning the art life, I guide artists through the model so they may have the tools to discover, envision, plan, and make decisions to live the art life they desire. I offer this model through workshops, artist accountability meetups and 1:1 coaching. My approach to delivering the model includes Appreciative Inquiry and graphic facilitation. Every year in November, I reflect on the past year’s accomplishments and re-evaluate my trajectory as an artist, graphic facilitator, and advocate for the arts. I apply the ACT model to myself and follow the steps to ensure the model is still relevant. Every year I am surprised by what I have achieved and what changes I need to make in my decision model and behaviors to “level up” my game. I love the challenge and learning new ways to model the way for other artists. In the fall of 2017, I landed back in Southwest Colorado after a 6-month sabbatical and 3-year hiatus near Washington, DC where I worked as a full-time graphic facilitator and senior consultant. While I applied the ACT model to my work as an organizational development consultant, I realized that the practical applications of the work had value beyond the arts. Upon return to the arts community I was once an active participant of, I wrote a grant to the Colorado Creative Industries (CCI) to scale the ACT model into a train-the-trainer program. I know the value of this work and the importance of it being accessible to others. Thanks to being awarded the Career Advancement grant from the CCI and National Endowment for the Arts (NEA), I can scale the ACT model and am looking for the opportunity to work with more artists in their pursuit of living a balanced art life. And as for me, I found it. The ACT model grew from 15 years of experience working with artists through community art centers, art publishing and career coaching. 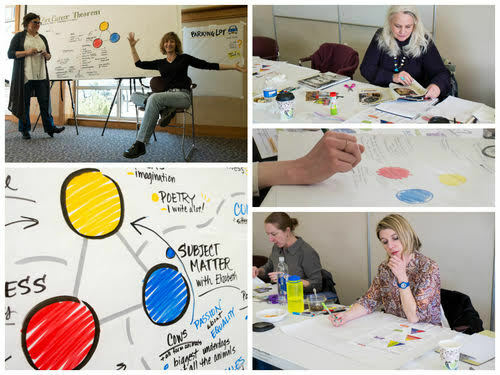 Heather Leavitt Martinez, an artist herself, uses graphic facilitation to coach artists through a series of self-assessments and exercises that increases self-awareness and guides artists to set values-based goals, make decisions, and sustain the art life they want to live. Many thanks to the Colorado Creative Industries and National Endowment for the Arts for recognizing the value of Art Career Theorem by granting the Career Advancement award to grow the program into a train-the-trainer program. If you are an artist who would like to learn more about becoming a visual practitioner or an arts coach, please email me. I would love to talk with you about the possibilities. I love that I learned so much more about you from this blog post, Heather! I didn’t know you were a magazine editor and an ED of an arts center. I bet those experiences contribute to how you manage the various parts of your visual practice and career. I am always amazed at how wickedly interesting our IFVP members are! Many many thanks for this classic article and play one of the classic happy wheels games free of cost without any payment the objective of the happy wheel is to get the victory over the rival.